I’ve often poked fun at some of the baffling and possibly dangerous-to-pronounce Scottish place/distillery names, and while I still think names like Bruichladdich, Bunnahabhain, and Dailuaine are fair game, I also feel just slightly sheepish doing so because I come from Wisconsin. If you’ve looked at a map of that beautiful state, you’ll see there is no shortage of baffling place names there as well. With towns like Weyauwega, Manitowoc, Oconomowoc, Ashwaubenon, and Mukwonago, a Wisconsinite isn’t really one to talk when it comes funny place names. Most of these names are Native American in origin; the Potawatomi, Ho-Chunk, Menominee, and Oneida tribes among others are responsible for a huge number of ’em, but any Wisconsinite worth their bratwurst can rattle them off as easy as you’d like. For personal reasons as well as phonetic reasons, one of my favorite Wisconsin place names is Kinnickinnic. There’s a not-all-that-beautiful Kinnickinnic River in Milwaukee and another far more beautiful Kinnickinnic River up near the somewhat bustling college town of River Falls. In Milwaukee, near the not-all-that-beautiful Kinnickinnic River, there’s a rather industrial-transitioning-to-neighborhood stretch of road called South Kinnickinnic Avenue (South KK to the locals), most famous in my mind for being the home of a beloved and bedraggled punk club called Cafe Voltaire and later the Odd Rock Cafe. If I remember correctly (and I’ve not lived in Milwaukee for some time, sadly), there was always a bit of regional debate as to how to pronounce Kinnickinnic. For some it was KINNICkinnic for others it was KinNICkinnic…for most it was just easier to say “KK”. A nuanced and minor debate, yes, but a potentially volatile one, especially later in the evening at any number of Friday night fish frys. 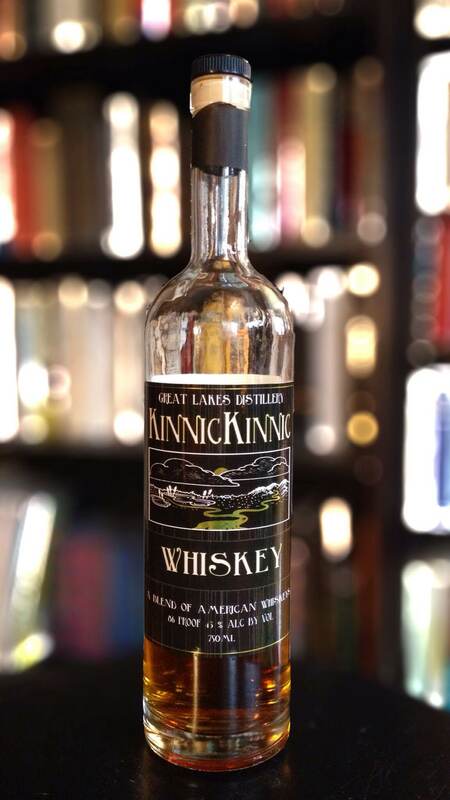 In any case, Kinnickinnic is an Ojibwe word for a blend of tobacco and local leaves, bark, and grasses, literally meaning, “what is mixed”. Great Lakes Distillery chose this appropriate title for their unique Kinnickinnic Blended Whiskey which is made up of sourced bourbon (reportedly around four years old, not sure from where), and their own young, perhaps barely aged, rye and single malt whiskies. Located in the great city of Milwaukee, Great Lakes Distillery was founded in 2004 and was the first distillery in Wisconsin since Prohibition. Like many craft distilleries, they have a varied line-up including eau de vie, vodka, gin, and rum that can quickly make it to store shelves while they wait for their spirits in barrels to mature. In a time when so many “craft” brands are at best elusive, and at worst outright lying about where their booze comes from, Great Lakes certainly deserves praise for being upfront and proud of the fact they are blending sourced whiskey with their own distillate to create a rather different product. The Nose: A light and subtlety different nose, at once bourbon-y and malt-y with a bit of heat. Initial notes of caramel-y, nutty toffee, thick honey, and maraschino cherries are followed by nice cracked rye and slightly beery malt notes with lesser hints of dark chocolate fudge. There are spice notes of vanilla extract, cinnamon, orange zest, and earthy pepper, with some dried leaves in the background. The Palate: The palate is a bit more weighty and sweet than the nose, but this is still a lighter whisky. An early, candied orange and orgeat sweetness is slowly joined by more dark chocolate and malted milk balls. While this gets a little spirit-y with some harsh sharp edges towards the end, there’s nice, slightly vegetal spice notes: cinnamon, dusty, tannic clove and crackling, peppery rye which is much bolder here than on the nose. The Finish: Medium-ish, the sweeter notes fade quickly leaving more of that drying peppery spice and just a touch of malt. Thoughts: One of the more interesting and unique American whiskies out there at the moment. The three whiskies blended here, bourbon, and the house-made malt and rye are integrated fairly well, though this does have a crisp, youngish, spirit-y quality to it. The palate is a little sharp around the edges, no doubt due to more youthful whiskies used. It’s ok as a sipper, but is quite nice over ice, and proves fairly interesting in cocktails. In the end, I think this is decent stuff but lacking the maturity to make it great. I hope Great Lakes sticks with this novel idea, as their own stock matures and their expertise at distilling and blending grows, there’s potential to release some great whiskies in this style.